Alexis Hutchinson was not on the plane when her unit deployed to Afghanistan in November. (CNN) -- A single mother who chose taking care of her infant over deploying to Afghanistan has been discharged, the Army said in a statement. 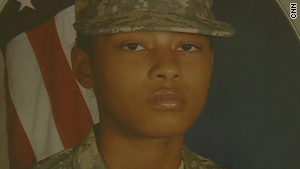 When her unit deployed to Afghanistan in November, Alexis Hutchinson was missing from the plane. Her lawyer said she refused to go because there was no one to take care of her then 10-month-old son, Kamani, and she feared he would be placed in foster care. But the Army contended that the young mother and now former Army specialist had plenty of time to sort out family issues and said she could face court-martial. The issue was resolved this week, the Army said in a statement Thursday from Fort Stewart in Georgia, where Hutchinson was training. "The soldier will not be tried by court-martial and therefore is not at risk of receiving a federal conviction," the statement said. " She is, however, reduced to the lowest enlisted rank, private, and subject to losing other military benefits from the Army and the Department of Veterans Affairs to which soldiers who serve honorably are entitled." Before shipping overseas, every soldier must sign military Form D-A 53-05, which states that failure to maintain a family care plan could result in disciplinary action. Hutchinson's attorney, Rai Sue Sussman, said the soldier informed the Army that her family care plan had fallen through and that there was no one to take care of her son. She was granted a 30-day extension to deal with the issue but still was not ready to deploy after the extension had expired, the Army said. "The investigation revealed evidence, from both other soldiers and from Private Hutchinson herself, that she didn't intend to deploy to Afghanistan with her unit and deliberately sought ways out of the deployment," the Army statement said. Hutchinson could not be immediately reached for comment.